Grass Valley introduces Focus 75 Live camera for SNG, OB and news and sports productions. Montreal, March 2016: Grass Valley is introducing the new Focus 75 Live, a highly affordable 720p/1080i switchable HD system camera. This camera represents a new entry level into Grass Valley's legendary imaging quality—widening the range of potential applications for customers with more options in format support. 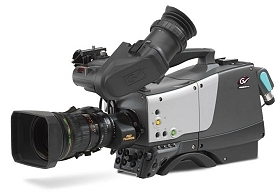 Featuring three fully digital Xensium-FT CMOS imagers with global shutter operation, the Focus 75 Live camera boasts a high level of sensitivity for productions where less lighting is available and can be used with a smaller iris setting to deliver an increased depth of field while allowing operators to hold a tighter focus. With a standard B4 2/3-inch lens mount, the Focus 75 Live can accommodate HD lenses already in customers' inventory. "Not every customer needs a full-featured top-of-the-line camera to meet their production needs, but they do want the legendary quality and performance for which Grass Valley is known," said Mike Cronk, senior vice president of strategic marketing, Grass Valley. "The Focus 75 Live camera gives customers an affordable point of entry with the ability to switch production formats on the fly, as needed." Focus 75 Live offers strong image performance by always capturing the image in full progressive 1920x1080 HD resolution and downconverting to either 1080i50/59.94 or 720p50/59.94 (user switchable). In addition, the highest quality SD signals are available at the camera base station. The Focus 75 Live camera is ideal for smaller live studio and field applications, including regional broadcast stations, SNG vans, small outside-broadcast (OB) vans, university sports productions, staging and houses of worship. To fully support the Focus 75 Live camera, Grass Valley offers a line of dedicated Focus transmission solutions including adapters and base stations in all versions of triax connections available on the market, and a SMPTE hybrid fiber transmission system based on the Lemo SMPTE fiber connector. The Focus 75 Live camera will be on display at the Grass Valley booth SL106 at NAB 2016.